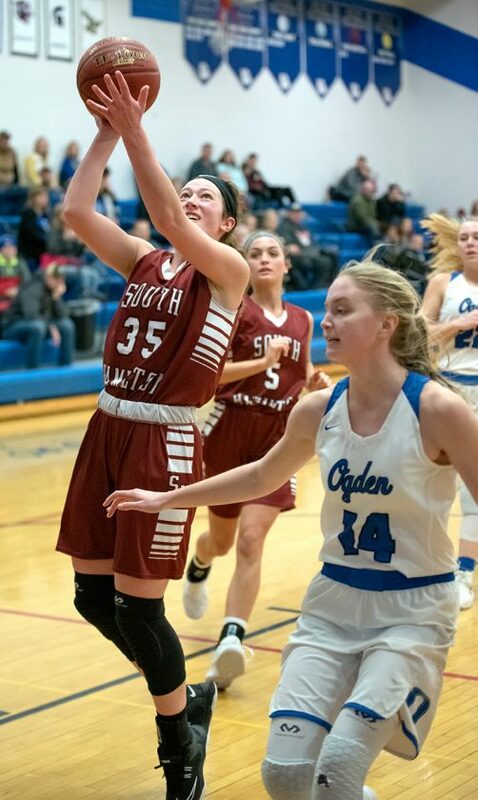 OGDEN — Big and physical, Ogden out-muscled South Hamilton and advanced in a Class 2A Region 7 first round girls basketball game here Saturday night. 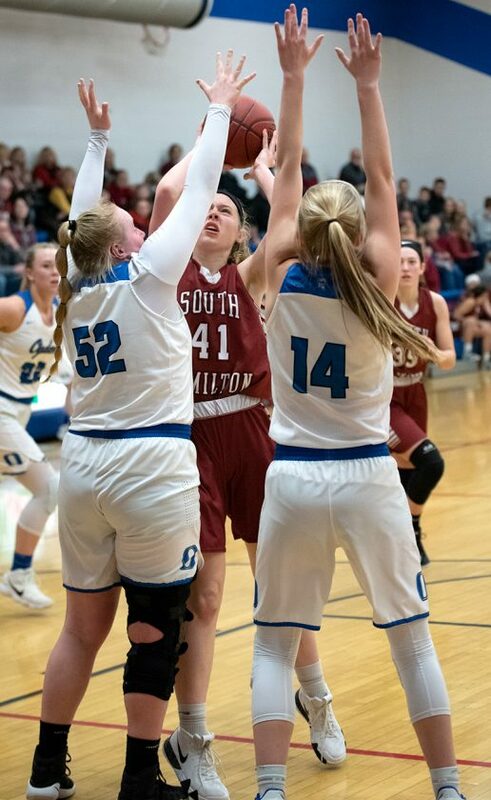 The Bulldogs (14-8) out-rebounded South Hamilton (7-14) 43-34 and collected 18 offensive rebounds to help offset a difficult shooting night en route to a 46-37 victory. Neither team cracked 30 percent shooting and they combined to make just 2 of 22 3-point baskets. Gabby Ross inflicted the most punishment, as she led Ogden and all scorers with 20 points. 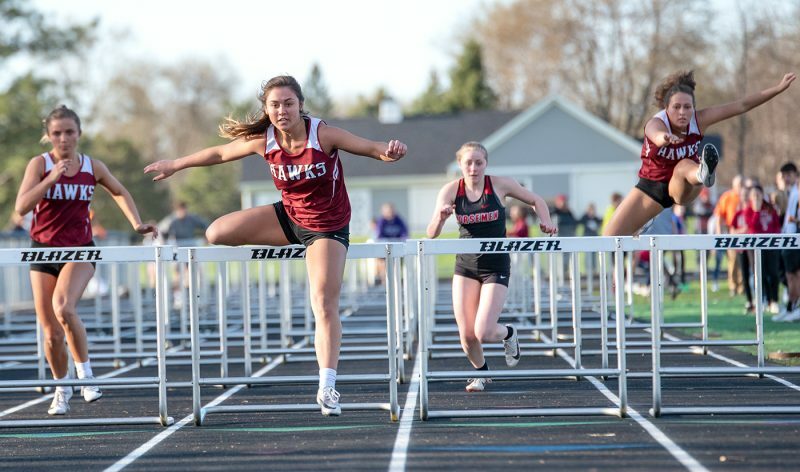 The Hawks received a team-high nine points from Sydney Friest, while Rylee Woodall and Aneesa Balderas added eight each. Breanne Diersen netted six in the loss to go along with five rebounds. Younger sister Hailey Diersen pulled down eight boards. Ogden jumped out to a 15-8 lead after one quarter and led 25-18 at the half. South Hamilton closed to within three points with two minutes remaining, but Ogden was able to put the game away at the free throw line. 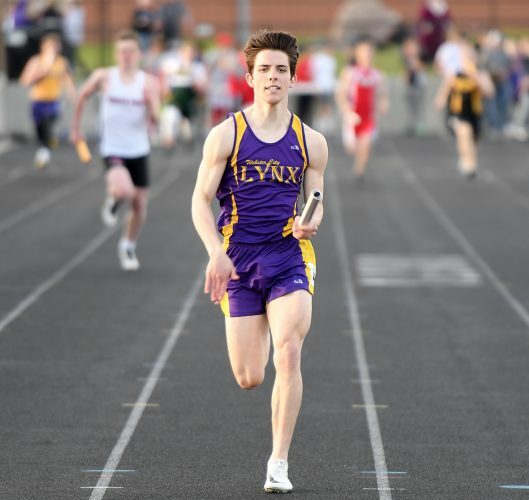 The Bulldogs went 8 of 15 at the stripe in the fourth and outscored the Hawks 16-7 on the night. 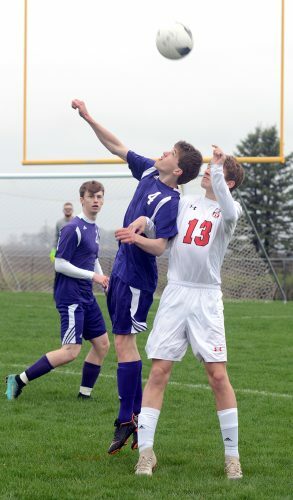 Ogden advanced to Tuesday’s regional quarterfinal round against seventh-ranked Dike-New Hartford in Dike. 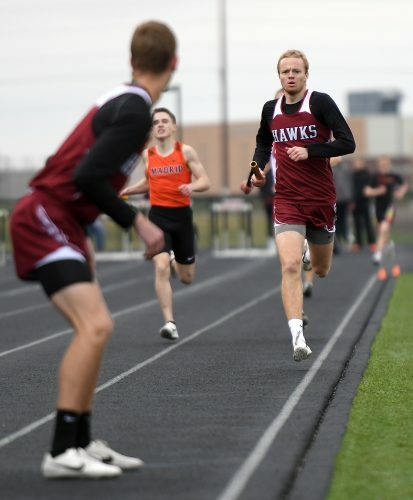 South Hamilton (7-14) — Rylee Woodall 3 2-6 8, Emma Lewis 0 0-2 0, Breanne Diersen 2 0-0 6, Brookelyn George 0 0-0 0, Aneesa Balderas 3 2-3 8, Brenna Barquist 0 0-0 0, Hailey Diersen 0 2-2 2, Sydney Friest 4 1-2 9, Caleigh Hewitt 2 0-0 4. Totals: 14 7-15 37. Ogden (14-8) — Abbi Lentz 0 2-2 2, Meredith Adreon 0 4-4 4, Denali Loecker 1 2-2 4, Faith Mohr 0 2-3 2, Abby Langel 2 1-4 5, Gabby Ross 8 4-6 20, Joelle Consier 1 0-0 2, Allea Klauenberg 3 1-4 7. Totals: 15 16-25 46. 3-point field goals — SH 2 (B. Diersen). Rebounds — SH 34 (H. Diersen 8, B. Diersen 5). Steals — SH 3 (Friest 2). Assists — SH 5 (Woodall 2, Friest 2). Turnovers — SH 17. Team fouls — SH 17, OG 16. Fouled out — none.